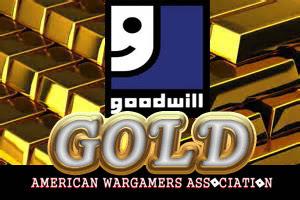 AMERICAN WARGAMERS ASSOCIATION: Goodwill Gold Episode 3 Action Max! Hello and welcome to Episode 3 of my Goodwill Gold series. Each Goodwill Goal episode will be about cool things that I find and purchase while adventuring through Goodwill. Today I've got a board game and a video game system that most of you will know much about, that also includes me! So I'm walking down the isles of my favorite Goodwill and I'm not finding much. I take a look down the board game and puzzle aisle, usually it's mostly puzzles missing pieces and "Scene It" games but they occasionally have big box computer games mixed within. So I see the word baseball and stop to take a look. My mom hates Pete Rose so I'm thinking she won't play this game. Statis Pro Baseball is a baseball simulation developed by Jim Barnes and produced by Avalon Hill between 1978-1992. To the best of my knowledge, I've never played any games by Avalon Hill but I know about them so I felt pretty safe with this purchase. Stasis Pro Baseball looks to me like a Strat-O-Matic clone. This copy has a baseball field board to play on and each player has their own card. The set I have has all the teams for the 1985 season, so close to the 1986 Mets. I plan on trying Statis Pro out so looks for that some time. Now my second purchase is from the same Goodwill and only one shelf over. I usually take a trip down the electronics aisle so see if I can find anything neat but unfortunately not. This day I was going to strike gold. While my eyes scroll down the shelves I see this box. 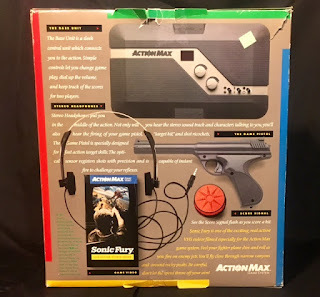 I didn't know much about the Action Max but I had seen a video about it online so I knew it was a video game console. Unfortunately, before I could get to it a couple pick it up to take a look at it. I then see them pull out their phone to give it a price check. 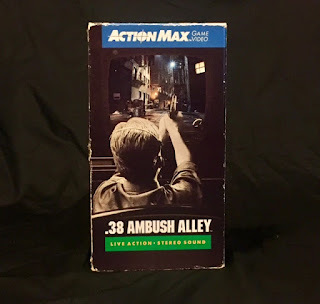 Luckily Action Max isn't worth too much so they put it back and it was mine for the low low price of $9.99. 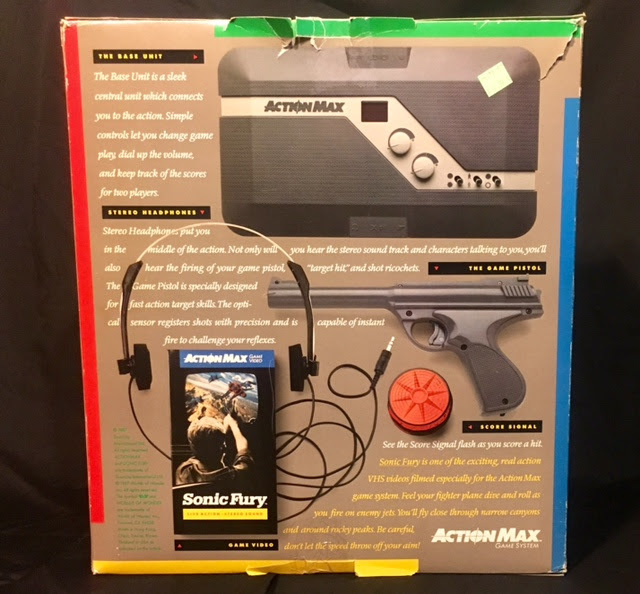 The Action Max is a light gun gaming system that uses VHS tapes. 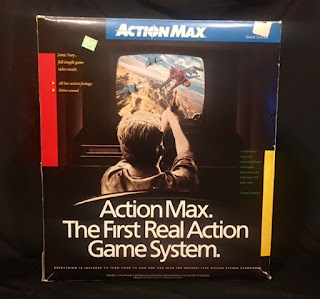 In order to use the Action Max, you need a CRT tv which wasn't a problem when this was new. You would attach a sensor to the tv and blast away at what was on the screen. 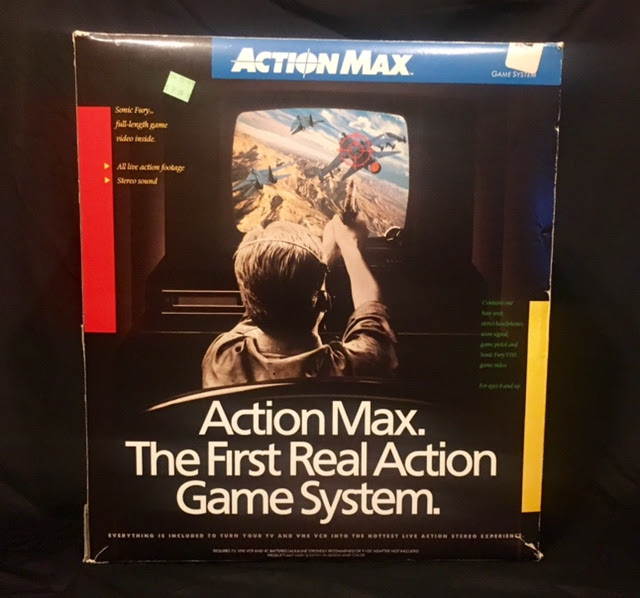 The system had a total of five games and since each game was exactly the same the Action Max had very little replay value. Before I purchased it I opened it up to make sure it had something in it. Fortunately, it had everything except the headphones which isn't an issue. But it was missing the game that comes with it. I went on Ebay and bought one of the games .38 Ambush Alley so I could give the Action Max a try. Statis Pro Baseball cost me $2.99 and the Action Max cost me $9.99 for a grand total of $12.98. Stay tuned for reviews on both of these games.